STAUNTON, Virginia, March 27, 2019 - Federated honored three of its members for their exceptional commitment and support of the Federated Co-Man, marketing and national accounts programs. Automotive Supply Company in Appleton, Wisconsin was named Federated Co-Man Member of the Year. This annual award is presented to a member that has shown outstanding support of the member-owned Co-Man warehouse operation and its programs. Rick Wood accepted the award on behalf of Automotive Supply. 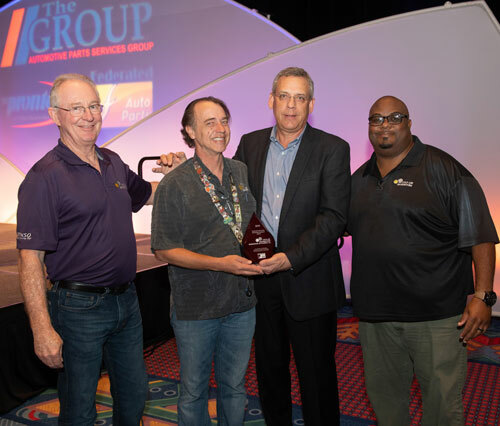 Cold Air Distributors of Fort Pierce, Florida was honored with the Federated Marketing Excellence Award. Accepting the award were Ken Bates, Denick Cobb and Kerry Humphreys. Parts Distributing Inc. (PDI), located in Milwaukee, Wisconsin, was honored with the Federated National Accounts Award. This top award recognizes a Federated member for excellence in serving national accounts customers. Donovan Haidinger accepted the award on behalf of PDI. Federated Auto Parts, headquartered in Staunton, Virginia, is one of the largest auto parts distribution and marketing organizations in North America. Federated is dedicated to supporting its customers with quality name brand parts, programs designed to grow their businesses, and experienced counterpeople who are knowledgeable in today's evolving automotive technology. For more information, visit www.federatedautoparts.com.